The Ink Spots might have had the original version, but Elvis was probably more influenced by Jimmy Jones and the Harmonizing Four's version. In any case, the Ink Spots' version was recorded on 15 February 1951 and released just a few weeks later, in April, on Decca 27494. The Ink Spots were formed in the early 1930s in Indianapolis. Their first recording contract was with Victor Records in 1935. The following year, Bill Kenny joined the group, replacing Jack Daniels as lead singer. 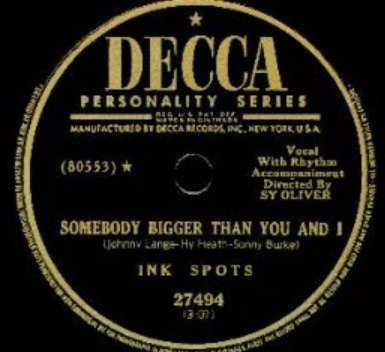 Kenny sings lead vocals on the Ink Spots' original recording of "Somebody Bigger Than You And I." He left the group in 1953, leading to the disbanding of the group. Kenny died in March 1978.